Flavor is the number one attribute of Weyerbacher’s line of ales and they range about 6-8% ABV. Beer is back—in a big way. Not that it ever disappeared–but there has been a growing interest in craft beers (or beers brewed at a microbrewery) across America as of late. Why? Well, we as a beer-loving nation are becoming more educated and demanding of our hops and this area of Pennsylvania is certainly setting the stage. With the Philadelphia region booming with microbreweries, Belgian restaurants blossoming (note the ‘Monks of the Main Line’ uber-popular Teresa’s Next Door on Wayne’s restaurant row) and one of the nation’s strongest metropolitan beer cultures (the impending second annual Philly Beer Week on the horizon March 6th-15th), the AML team thought it was due time to launch our innovative brewcation series. We will be highlighting local breweries in the Philadelphia region this year and educating our growing online audience about the great local brews in the ‘burbs and surrounding area. So, a few weeks back we headed up the PA turnpike for our first ever brewcation. It was just about a 90 minute ride to Easton, PA, home of the Weyerbacher Brewery, where myself and my staff photographer Kevin McPherson (www.kevinemcpherson.com) got a full-fledged tour and a fun sampling and education about the Weyerbacher line courtesy of brewmaster Chris Wilson, national sales manager Bob Fauteux and Chris Lampe, Weyerbacher’s production manager.Weyerbacher Brewery began in 1993 when founder Dan Weirback, an avid homebrewer and microbrew connoisseur, toured the Long Tail brewery in Vermont while vacationing with his wife, Sue. Two years after the inspirational trip, Weyerbacher was launched in August of 1995. Weirback originally started out with the intention of making mainstream microbrews. But, after they brewed their first big beer in 1997 (Raspberry Imperial Stout) which was a favorite homebrew recipe of the Weirbacks, that strategy changed. Each Saturday afternoon, hundreds of beer lovers have the opportunity to tour the brewery for free, create their own custom variety pack and hang out and sample the latest hops on tap at the Weyerbacher bar, how fun! The brew house and storage area is at the rear of the one-story building and is where the magic (and our tour) begins. Most notable as we walked through the large warehouse doors is that the room is stacked floor to ceiling with hundreds of bourbon barrels. They appear out of place since I would be expecting to see them as part of a tour of a winery, not a brewery, but interestingly enough they are used as a staple part of some of Weyerbacher’s craft beers. Weyerbacher incorporates the barrels to age two of their current year round brews: Old Heathen (an imperial stout) and Blithering Idiot (a barley wine). 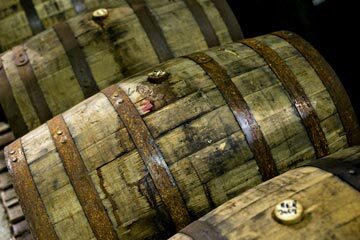 “It’s interesting; the barrels enhance the original flavor by supporting it with bourbon, vanilla, oaky flavors. So, those barrels turn Old Heathen into Heresy and Blithering Idiot becomes Insanity in about a month’s time. Our American wild ale, Riserva, however, is in (the barrels) for a year which is a whole different ballgame,” explained Wilson. Small craft breweries across the country are commonly using barrels to enhance their production process and variety. It’s also becoming common to use wine barrels. “The American oak barrels are very interesting. While we only age it for a month, they come to us having been used for over a decade for bourbon, obviously. In that situation, the bourbon has done the work for us; it is slowly soaked in the cask for years. We only use them once and they are resold for other purposes,” said Lampe. The brewing process starts with the raw product-the grain, which is stocked in the silo outback and then fed into the warehouse gristcase. The grain goes through a mill which smashes the malted barley cracking it open so the natural sugar can be accessed. Then the recipe of that respective craft beer can begin as it is customized to the beer that is being brewed. Each recipe is made up of different specialty malts that give it a unique flavor as each malt is considered one ingredient. “The first lesson I like to start out with is: ‘You can’t judge a beer [only] by its color.’ Simply viewing a beer is not an accurate assessment of what it may have to offer from a taste and aroma profile. Some are dark in their shade and some are light in color and there are many reasons for that-so I am here to educate as a brewmaster what goes into the process of a flavor profile. There are varying differences in ingredients and yeast but the brewing process is essentially the same. Simply stated, a stout is going to have more dark malts, pale ale is going to be base malt or 2-row barley, with more caramel in its personality,” explained Wilson. Weyerbacher is the first non-trappist brewery to brew and bottle a Belgian-style Quadruppel. 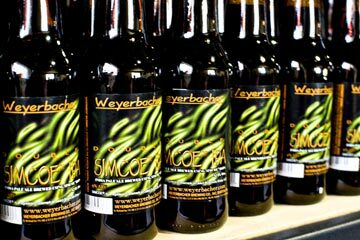 Weyerbacher is constantly producing new ales but also committed to sticking with some of the staples that their customers have come to embrace. Some of the brews are rebranded from small initial trials and given a second ‘birth’ in the marketplace. With one of the newest beers, Fireside Ale, Weyerbacher originally brewed it as a one-off last November (meaning they brewed a small batch as a test run) and it was known as ‘Charlie.’ The public response to Charlie was very positive so they decided to bring it in as a seasonal brew. Fauteux, a beverage industry veteran, says the brewery is very cognizant of public feedback and expectations are high with beer aficionados. “We want to have something marketable, make a name for the beer that is unique but it also has to describe the beer itself so when the customer sees the label they have an idea of what to expect from that particular ale. It’s important to keep it fresh but know that the quality has to be in the bottle, and that’s the bottom line. This industry is too competitive now not to take craft brewing-every single beer-very seriously because the public is sophisticated and knowledgeable about what is out there,” said Fauteux. One of the most interesting parts of our guided tour at Weyerbacher was going up on the brew ‘deck’-a large metal platform about ten feet off the ground which is home to four large vats or tanks-the command center (so to speak) of the brewing process. The first tank is called a mash tun-it draws the crushed grain from the gristcase and mixes the mash together. The water and the grain (sometimes up to 2,000 pounds of malt) are cooked in the first large vat between 144 degrees to 160 degrees Fahrenheit. “Temperature is a critical part of the brewing process; a few degrees either way can drastically alter the finished product and flavor-affecting the amount of unfermentable sugars, also known as dextrins. A higher temperature will produce more dextrins and less fermentable sugar while a lower temperature results in a higher fermentable sugar content and less dextrins,” Wilson explained. “We have a set process we go through with each beer, very much like a chef would follow with a recipe so the batches are consistent. With Fireside (Ale), I know just what temperature it needs to be set at. Then we let the mash rest for an hour and that is when the enzymes go to work as they convert the sugars-breaking down the long glucose chains into more simple sugars that the yeast can ‘eat.’ After that, we actually raise the temperature again,” explained Wilson. Weyerbacher launched four new beers last year and shows no signs of slowing down--as they are one of the most popular craft beer lines on the Main Line. After the mash has gone through the reps it is transferred over to the second tank, the lauter tun. Lautering is a part of the brewing process essentially separating the liquid from the grain, much like a coffee filter. (The unused grain in this part of the process is sent out to farms to recycle it as feed for cattle.) Vessel 3 is the boiling kettle that can hold up to 40 barrels. The liquid that is about to be boiled is called wort-it is very sweet in its flavor and does not contain any hops. The wort is boiled for 60 to 90 minutes and then the batch is transferred to the fourth and final stage—the whirlpool tank where the hops and proteins end up in a cone. The hot wort (originally at around 180 degrees) then goes through the heat exchanger-passed on to the fermentors where the yeast is added. One batch on any given day can take between seven to twelve hours. The hops add bitterness that calm down the stern sweetness of wort or the malt. “It’s a constant struggle, to balance out these two essential parts of the process-experience plays a big part in it. And, hops come, obviously, from all over the world. We add them in the beginning for bitterness and at the end of the boil we add more hops in to add flavor and aroma,” said Wilson. The Weyerbacher Brewery produces between 20 and 40 barrels of beer-approximately 31 gallons per barrel-daily and its shipped to wholesalers in 14 states. Bottoms up for your brewcation! 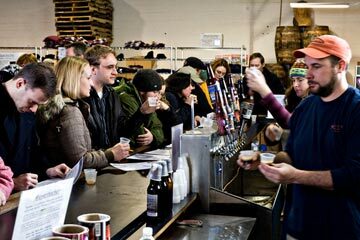 Part of the fun of the Saturday brew tours are the free samplings offered for all visitors. The beer ferments in the fermentation tanks for two weeks and then it is filtered using the diatomaceous earth filter. The filter uses (essentially) the same calcium product used to clean swimming pools. “The beer is clarified here, from cloudy to clear. The ‘bright’ beer is carbonated and then the beer is kegged in half barrels or sixtels. 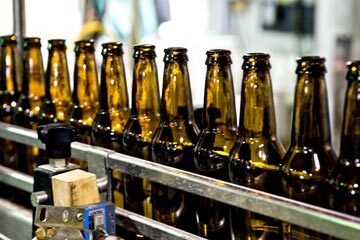 Or, it is put in bottles on the machine and as the beer comes through a hose, the bottles are sealed and crowned and labeled and packed by individuals into the cases. So, this is relatively hands-on, probably why no one who works in a brewery has a beer gut,” said Lampe. The machine filling the bottles works at top speed filling one hundred bottles a minute, roughly 260 cases an hour. When you are transferring the beer to the fermentor, Lampe explained, the brewer welcomes oxygen. But, once it gets to the bottling process, 02 is the enemy so several steps are in place to watch each batch from start to finish. And, Weyerbacher oversees each step to make sure that what they are offering the public is a consistent, great craft beer line. All brews are checked for proper aroma as well.”If you are not brewing a quality product, you are going to hear about it from the people-especially in this area. There is a refinement to what we are doing as craft brewers in a competitive market. And, Philadelphia has really grown into what I truly believe is the finest craft brew market in the country. Jim Koch from Sam Adams, Sierra Nevada and Anchor Brewing Company kicked off this craft beer phenomenon about thirty years ago. So, the public began to be educated about expecting more from their beer and understanding it was a different type of product they were used to. This is not your normal beer-what we are doing is akin to creating a fine wine,” explained Fauteux. Weyerbacher will launch a brewer’s select Belgian pale ale this spring—not yet named. 1)	Hops Infusion: Its name tells you it has a lot of hops in it, so for beer novices (like me) it’s a start to learning about one of Weyerbacher’s staple ales. And, as I’ve learned, an IPA beer (India Pale Ale—see the great description on wiki) is going to have a certain amount of ‘hoppiness’ and an expected amount of bitterness. Hops Infusion boasts a rich copper color and is one of the ales available year round with the brewery. “We get complexity over this beer; this is a great beer for very spicy, flavorful foods. We made this with seven hop varieties and accented it with notes of grapefruit—you can also taste the toasted caramel malts in it. I would absolutely pair this with Asian cuisine, maybe Thai food, because the hops really cut the heat back with its flavor profile,” suggested Wilson. 2) Double Simcoe: No surprises in this label either as this ale is a double IPA—the brewer doubled the brew and doubled the hops. “This is unique in that we use a single hop variety, a hybrid hop called simcoe, and that is a trademarked ingredient that they allowed us to recognize in the name. This is very bitter beer with a malt flavor—I would call this an assertive bitterness,” explained Wilson. Match up Double Simcoe, 9.0% ABV, with a spicy pork slider (Fautaux’s favorite pairing), or anything that has a fatty profile because the hoppy beer (with hints of pineapple and citrus) compiled with the carbonation will cut through the fat and compliment the food in a different fashion than a traditional pairing of red wine. 3)	Blithering Idiot: The name attracts attention of course—comical and clever. But don’t let it fool you! Weyerbacher is super serious about the beer they are producing. “This is a barley-style beer, 11% ABV. We make it more of an English style, which means there is less assertiveness in the bitterness as Blithering [Idiot] is more about malt flavors. 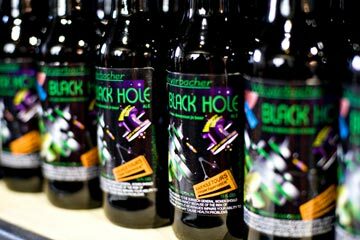 You should be getting a raisin-like, toffee flavor from this after a few sips,” Wilson described. As for food pairings, a barley wine can be challenging. But, strong cheeses work well—as in something comparable to a stilton cheese. Wilson said he would recommend Blithering Idiot as a dessert beer and even an after dinner drink which would really wow your winter company! 4)	Merry Monks: One of the top two sellers for Weyerbacher and a hugely popular brew among Main Line beer lovers (and the AML staff), Merry Monks has an interesting flavor and makeup. It is a Belgian style Abbey Tripel, which means the Belgian yeast imparts fruitiness. “As the yeast is ‘eating’ the sugars, it’s creating these compounds which are giving off an aroma that is very distinct,” said Wilson. Fateaux added Merry Monks is very drinkable ale and appealing to women as it’s sweet and gives off almost a banana or hint of fig flavor to it. Weyerbacher launched Merry Monks Ale in a 25 oz. cork-and-cage champagne bottle this past fall, offering an elegance and excitement for any beer lovers party table. It has a champagne quality and a creamy carbonation—yet delivered with the expected qualities of a delicious craft beer. Merry Monks cool cork-and-cage champagne can be custom ordered at The Beer Yard in Wayne. AroundMainLine.com is sponsoring “When Irish Eyes are Smiling”, Weyerbacher’s Philly Beer Week Event at The Irish Pol in Old City on March 13th from 6-8:30pm. Join us for a cold one and a chance to win door prizes! 5)	XIII: The brewery’s anniversary beer celebrates thirteen years of great Weyerbacher wallops offering a unique Belgian imperial stout that has a smooth flavor supported by the use of five malts. 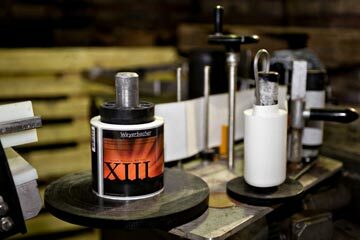 XIII uses the same yeast as Merry Monks and delivers a formidable coffee flavor—its Romanesque label communicates its authority as a 13.6% heavy hitter. “It’s a favorite of mine; we have gotten tremendous reviews for this. I think it’s the best anniversary beer yet for the company,” beamed Fauteux. My staff photographer, Kevin McPherson, keenly suggests a steak with peppercorn sauce during our beer tasting party with the Weyerbacher staff and Wilson agreed—adding roasts and pork chops are also good options. If you are thinking along the sweets line, crème brulee or bread pudding would match up well with XIII. For real foodies and Main Line gourmets, Wilson suggested both Merry Monks and XIII make a great marinade as well. 6)	Fireside Ale: The newest beer in the Weyerbacher line launched in January, but originally was released as ‘Charlie,’ the third installment of the Brewer’s Select Series, late last year. Fireside Ale is an intricate dark ale with just a touch of smokiness and is now part of the brewery’s seasonal lineup. The rich malt flavor, crisp bitterness and smoke reach perfect equilibrium in this brew. At 7.5% ABV, Fireside Ale will warm you up as the temperature drops. Wilson recommended pairing it with pork tenderloin or chicken soup and you are all set for a great winter treat.by the fire! 7) Imperial Pumpkin Ale: Weyerbacher’s 8.0% ABV pumpkin ale is the ‘mother’ of all pumpkin ales as Wilson described. It is heartier, spicier, and more “caramelly” and “pumpkiny” than its faint brethren! Weyerbacher added lots of pumpkin along with cinnamon, nutmeg and a touch of cardamom and clove giving this beer a spicy, full-bodied flavor. This truly is an Imperial Pumpkin Ale and is a perfect finisher on a cool autumn night, or matched up with a slice of pumpkin pie and fresh whipped cream. It’s an ale available August through November. “Many people do not realize that pumpkin ales are challenging to brew—we are working with 120 pounds of pumpkin right from the can. We use so much pumpkin that it clogs our filter six times on every batch! We have this out on the market first week in August about—by the time you get to Thanksgiving this is usually sold out or impossible to find,” explained Wilson. 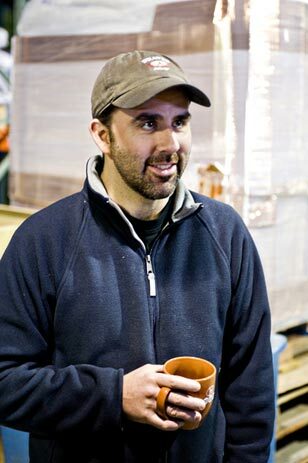 Fauteux adds: “Pumpkin ales have developed their own respective category, they are very popular. This year we fully expect to double our sales of our imperial ale. And, it has been a great creative beer for food connoisseurs. Someone emailed us to tell us they poured a few ounces of our pumpkin ale over a bowl of vanilla ice cream—that was a great idea,” Fauteux said. Race Street Café, 7-9pm 208 Race Street, Philadelphia. Want to take your own brewcation? Weyerbacher Brew Tours are available every Saturday. For a complete schedule and directions visit their website: www.weyerbacher.com. 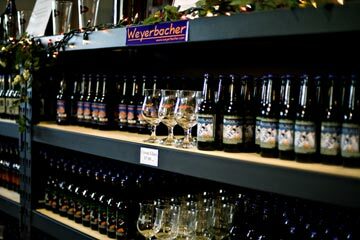 Weyerbacher beer is available at The Beer Yard in Wayne, PA. The Beer Yard (www.beeryard.com) is located behind the Wayne Starbucks on Lancaster Avenue and is open seven days a week: Monday – Thursday 10AM-10PM · Friday – Saturday 10AM-11PM and Sunday Noon-5PM; call 610-688-3431.If you are interested in carrying Weyerbacher beer at your Philadelphia region business or restaurant, contact Origlio Beverage: www.origlio.com or call 215-698-9500.